Summer is on the Way! 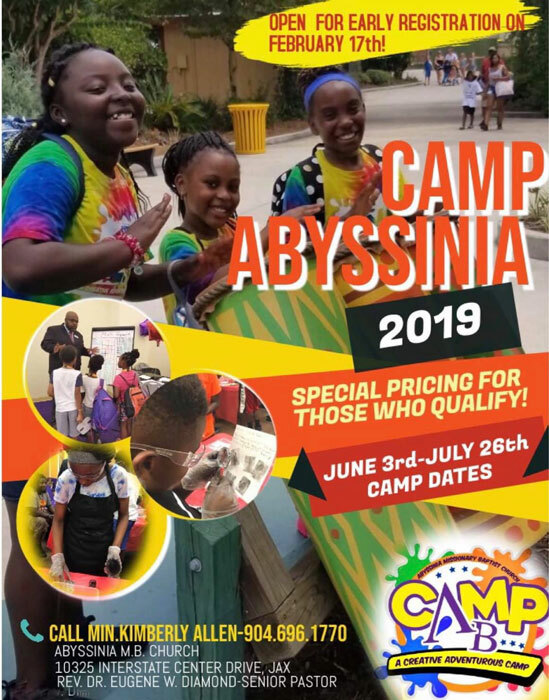 Welcome to a creative experience at Camp AB at Abyssinia! Camp AB is gearing up for another exciting summer. If you are looking for fun, inspiration, education, and adventure, this camp is definitely the place for your children. Camp AB offers a variety of unique and exciting camp adventures, fun, and learning experiences. Our staff has put together a full schedule which includes academic enrichment where we focus on the key areas of Math, Phonics, African American History, Writing, Reading, creative arts and crafts, music, a career fair, games, field trips, swimming, fitness, athletics, and so much more. This year’s camp enrollment will begin on February 17th. Our Summer Camp Open House & Parent Orientation will be held on June 1st at 9 a.m. Applications will be available on the church’s website and camp signups can be done on Tuesdays – Thursdays between the hours of 10 a.m. to 5 p.m.
Camp AB offers (6 weeks) camperships for qualifying families through The Kids Hope Alliance. Campership slots are limited and a report card is required at time of enrollment. A payment plan process has been created to help you register your child for this year’s summer camp. A fee schedule has been provided for you on the back of this letter. Camp fees are due every Thursday, prior to the upcoming camp week. Campers will not be allowed back to camp if fees are not paid. Payments can be made via cash or credit/debit cards. Please note that no personal checks will be accepted. Parent Manuals will be available once the activity fee is paid in full. If you have any questions or concerns, please do not hesitate to contact us. We look forward to a great summer with you and your child! Thank you for choosing Camp AB!